Chloride (Cl) is a highly mobile nutrient in soils and topdressing is typically a good time for application, especially in regions with sufficient precipitation or with coarse-textured soils are prone to leaching. As with nitrate and sulfate, Cl soil testing is recommended using a 0-24 inch profile sample. Based on current data, the probability of a response to Cl in dryland wheat production in northeast and central Kansas seems higher than in western Kansas. 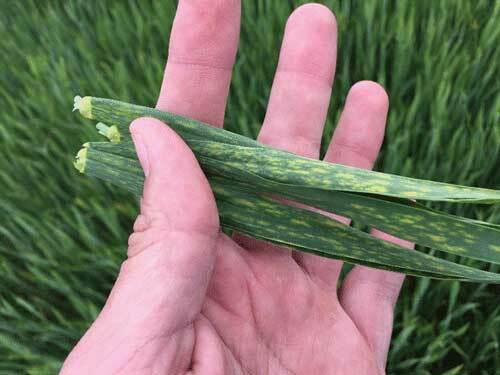 Chloride deficiency symptoms appear as leaf spotting and are referred to as physiological leaf spot. Figure 1. 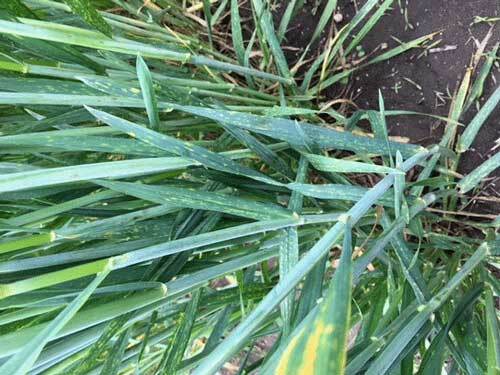 Upper and lower photos both depict chloride deficiency symptoms (physiological leaf spotting) in wheat. Photos by Dorivar Ruiz Diaz, K-State Research and Extension. K-State has done considerable research on Cl applications to wheat since the early 1980’s, mostly in the eastern half of the state. Results have been varied, but there have been economic yield responses in almost all cases where soil test Cl levels have been less than 30 lbs per acre (Figure 2). Figure 2. Relative wheat grain yield as affected by total chloride supply (soil + fertilizer) in Kansas. Deficiencies were most likely to be found on fields with no history of potash (KCl) applications. Recent studies showed that there are variety differences in response to Cl and are likely associated with the tolerance of that variety to fungal diseases. This page generated in 0.0173 seconds.